Secluded Sweets Shop Hidden in a Garden by Mystical Kosuge Shrine. 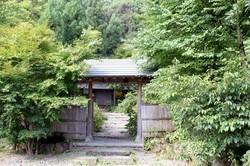 Kosuge Shrine has historically been one of Nagano's abodes of ascetic hermits. Hidden in a flower garden near the trailhead is this tiny sweets shop. With cherry trees, hydrangea and a myriad of flowering plants and trees out the large picture window, guests enjoy the parfaits with sweet adzuki beans. 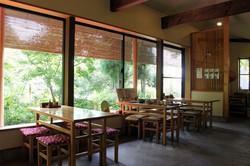 Light meals of soba and wild mountain plants also available. Closed irregularly during the green season and completely from late Nov.until late Apr. From Togari-Nozawa-onsen Station(JR Iiyama Line), 15 min by taxi. By bus, take the Nagaden bus bound for Nozawa Onsen and get off at the Sekisawa stop, then 60 min on foot. From Toyota-Iiyama IC, via Route 117 towards Nozawa Onsen. Cross the Tokiwa Ohashi Bridge, then before the gas station turn right, then approx. 2km.